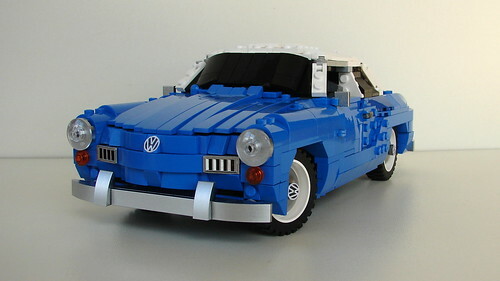 LEGO models my own creation MOCpages toys shop VW Karmann Ghia. It`s the first time in almost 5 years I`ve posted a classic car model. Designing of this model started back in june 2014 and was paused in december 2015, when Vibor Cavor posted his splendid Karmann Ghia model. After that I felt it was pointless and a waste of time, trying to improve my own model. But after I finished my Nimbus with sidecar, which also contains a lot of curves. And because I didn`t have any other plans for new models, I reloaded the old Karmann Ghia file again and started a new series of improving iterations. And suddenly I found myself ordering bricks to complete the model. It isn`t all perfect, but at some point you simply have to stop, and just be happy with what you got so far! The windscreen and glass areas are a vital part of the overall impression of the complete shape of the car. But because of the limited palette of trans-clear bricks I decided to do the window sections in black as if it was tinted glass. The model features a Hand-Of-God steering via one of the exhaust pipes. 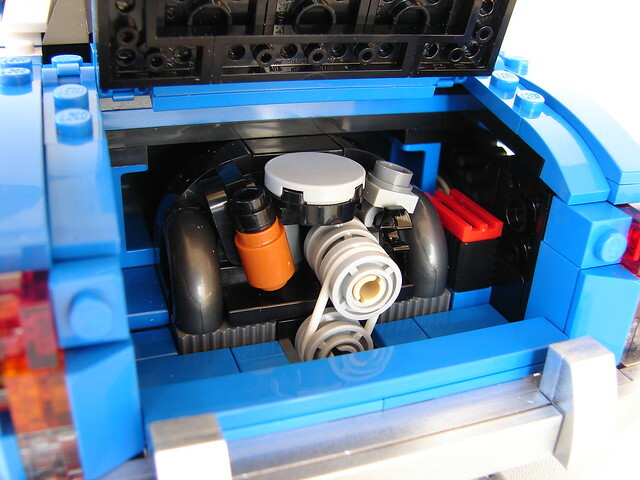 Doors open to a full 4 seat interior and the rear open to reveal the well known flat 4 beetle engine. Silver colored pieces, bumpers, hubcaps etc. are all spaypainted. 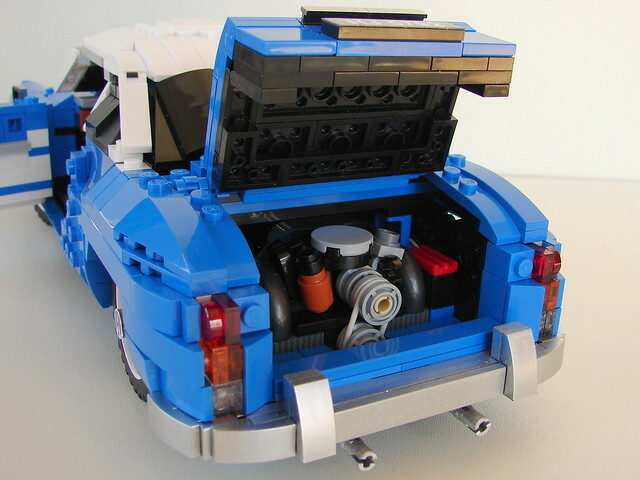 Two wedge bricks used under the rear side windows doesn`t exist in blue, and are painted. How could I miss this beauty? 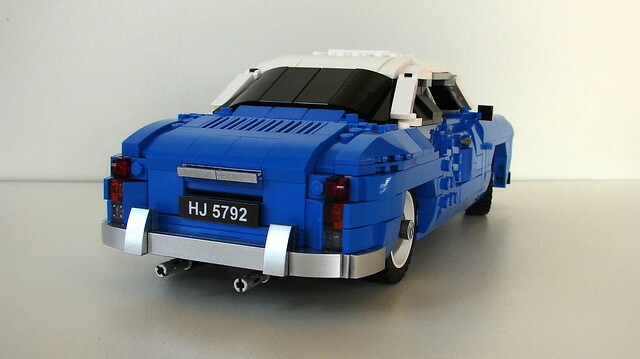 Brick-built windscreens are not my personal preference but apart from this your model is just fantastic! Keep it up! Quoting Brick Designers This is amazing! 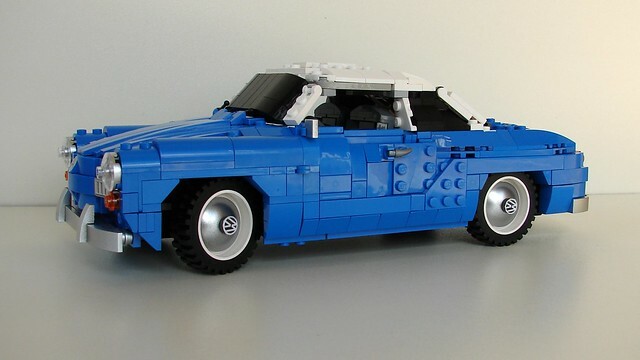 As someone mentioned, the amount of bricks/plates in different angles is massive but it works perfectly to make it look like the real car, which is not an easy design to recreate. Kudos! Thank you very much Brick Designers, and I`m very sorry for this late response to your comment. There has been a lot of downtime for MOCpages lately, so I failed to see your comment. It was indeed a complicated build, and I`m glad you like it! This is amazing! 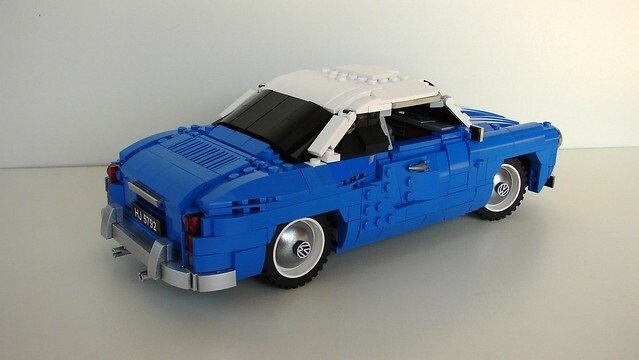 As someone mentioned, the amount of bricks/plates in different angles is massive but it works perfectly to make it look like the real car, which is not an easy design to recreate. Kudos! Quoting Doug Hughes Henrik, this is glorious!! Quoting Aliencat * Very cool! Great looking car model! Thank you very much for this delightful comment Jim! I also wish LEGO would widen up the palette of trans clear elements. It would also add more possibilities for aircraft cockpit design. Regarding a GT4 Celica, I think I have to disapoint you. Somehow I find modern era cars less interesting. Very cool! Great looking car model! Quoting Alex Sonny Wonderful! The shape is spot on with the very low roof. The hood is absolutely brilliant and very complicated I presume. Just a question, what is the axle going from the rear exhaust to the front for? Thank you very much Alex! The hood isn`t that complicated because the 1x10 curved slopes have a built-in possibility for half a stud offset, but a few jumpers were used too. All slopes of the hood are placed on hinges under the dashboard. This building method makes it impossible for the hood to open. The HOG steering works via the exhaust pipe, but I have to change it because it steers opposite the turning direction of the HOG-wheel. Wonderful! The shape is spot on with the very low roof. The hood is absolutely brilliant and very complicated I presume. Just a question, what is the axle going from the rear exhaust to the front for? Quoting Daniel H. Holy cow! My mind is blown! The shaping on that is just insane! Superb work man, keep it up! Quoting Emmett Martens This is sow amazing!!!!! 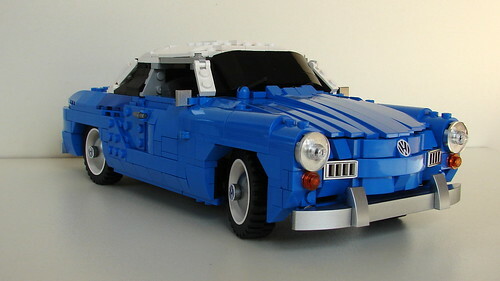 i rarely ever see a lego karmann ghia and this one is awsome. Thank you both, it`s very much appreciated! This is sow amazing!!!!! 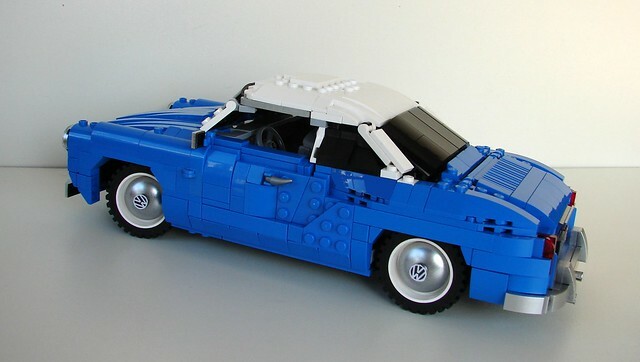 i rarely ever see a lego karmann ghia and this one is awsome. Holy cow! My mind is blown! The shaping on that is just insane! Superb work man, keep it up! Quoting Petr Chval Amazing! And it looks great in blue. Thank you very much, Petr! Amazing! And it looks great in blue. Quoting Master Shifu Leo J It's a thing of beauty! Thank you very much Master Shifu! Quoting Per Bonde Instant classic. You never disappoint. Very impressive build, again! As always lots of details and knowledge put into your build. Thank you very much Per! Instant classic. You never disappoint. Very impressive build, again! As always lots of details and knowledge put into your build. Quoting Spencer D This is excellent! I love the scale and level of detail. The engine in particular, awesome! Thank you very much Spencer D, I`m really glad you like it! Quoting Red Brick Nice set of wheels! Quoting Mark B. Love it. The shaping is extremely well done, but I really like the engine and undercarriage detailing, which would have been easy to leave out. Thank you very much Mark, great comment, much appreciated! Quoting Tom Remy Those rounded shapes are amazingly well done! Thank you very much Tom, looking at your Tintin rocket, you`re amazing with the rounded shapes yourself! Thanks for the huge awesome, Parrington! Quoting Elk Guard Great job, a real classic! I do like criticism, especially when it`s elaborated. It makes one strive even harder to reach a perfect result. Thanks for the comments and the extra like! Quoting Daniel H. Sweet holy moly, that's amazing! Such a great build! Stunning work! This is excellent! I love the scale and level of detail. The engine in particular, awesome! Love it. The shaping is extremely well done, but I really like the engine and undercarriage detailing, which would have been easy to leave out. Those rounded shapes are amazingly well done! Great job, a real classic! Amazing shape and build. I love the blue. The inside is fantastic and the front is amazing. Great work. Sweet holy moly, that's amazing! Such a great build! Stunning work! Quoting Clayton Marchetti Sorry about that. I meant the contours behind the doors. I thought so, but wasn`t sure! I`m quite happy with the shape and contours of this area, but didn`t see any way to get rid of the studs. 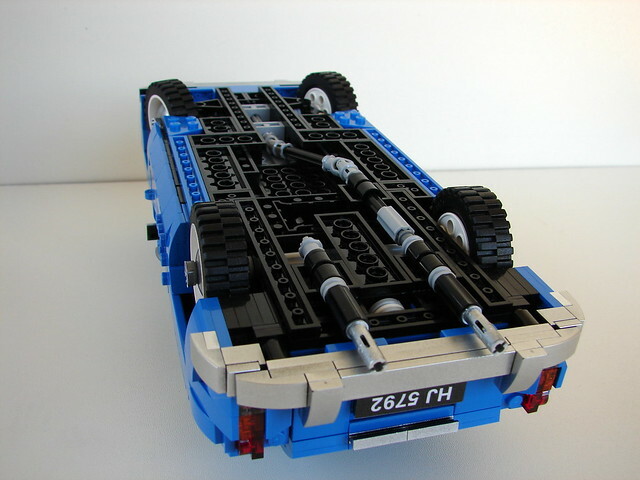 The good thing is, now you see it`s LEGO! Quoting Lawrence Loves Star Wars Amazing shape and build. I love the blue. The inside is fantastic and the front is amazing. Great work. Thank you very much, for this nice comment! Quoting Blaine R. Outstanding work on the shaping. I know these cars shape well, as I resurrected my wife抯 grandfathers car that he had bought new after it had been in storage for 30 years. Thank you very much Blaine, another nice little VW story, hope it is good shape! Quoting Vitruvius Mint Consistently built MOC. Nice colors too. Quoting Chess Knight Simply gorgeous. Quoting Sven ;o) Henrik my friend, you did it again. 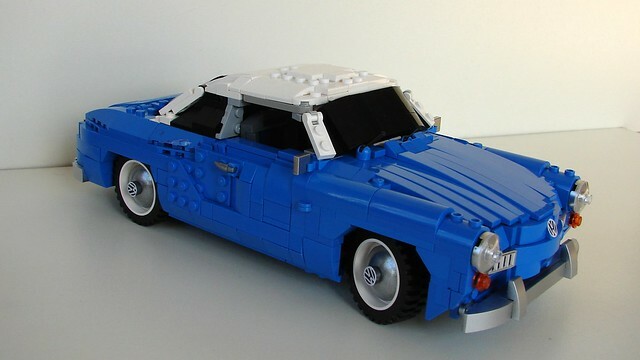 Absolutely fabulous work on this model of the Karmann Ghia. Every detail is spot on. Love it! Thank you very much Sven! It`s highly appreciated to have your comment and "Like" here, and the faves on Flickr! Quoting Michael Ab. The shape is great and I just love the little engine. Very good! Quoting Vibor Cavor Hey, there. So, you finally did it! It is different from mine which I like. You have your own style and it works. It is really well done. It looks more sporty than mine which I also like. The thing that I'm not a fan of are the windshield frames. They look too loose but all in all it looks cool, especially the front! Thank you very much Vibor! Yes finally I finished my own take on the K-G. and you`re right, I did use quite a different approach, but they are almost identical in size, 14-wide and using the same tyres! You`re not the first to criticize the roof pillars, but I didn`t see any other options! Sorry about that. I meant the contours behind the doors. Quoting Gabor Pauler Mindblasting shaping! Thank you very much Gabor! Thank you very much for all the WOWs my friend! I`m really glad you love it! Quoting Jeremy McCreary I had many important "firsts" in my first car -- a 1970 VW Beetle. But I would rather have had them in a Karmann Ghia -- one of my favorite cars then and now. Wonderful job here, Henrik! The engine is instantly recognizable, and the rear body shaping is spot-on. Glad you decided to forge ahead. Thank you very much Jeremy! I haven`t owned any VW at all, but I would surely love to own a Karmann Ghia, my favorite classic car! Quoting Kurt's MOCs Beautiful work and great memories! The design and shaping of the bodywork are phenomenal. Great details and the engine is perfect. Having owned one, briefly, I can attest that the real engine did indeed run on an elastic band and was actually that small! Thank you very much Kurt! Great comment my friend, highly appreciated! Quoting Grim Block Insane shapping. Colorfull and the details are so precise... Totally nailed it! Thank you very much Oliver, nice little story there my friend! Quoting Nick Barrett So pretty - you've done the K-G real justice. Makes you want to get out and drive doesn't it ? I would love to drive one of these! Thank you very much Nick! Quoting Clayton Marchetti Positively gorgeous! 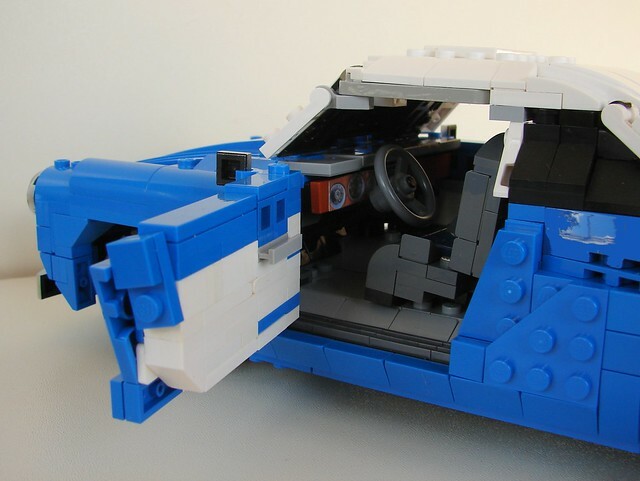 The shaping of the car especially the rear passenger doors are magnificent! I Love the engine. As always a real pleasure to see your builds. Thank you! Thank you so much Clayton! Rear passenger doors? I`m not sure what you mean, but I`m glad you like it! Quoting killswitch95 (Last Name is Dank AF) Awesome shaping. Quoting Michael P Fantastic car! Quoting Michiel Norp Excellent shape and the steering solution is genius. Thank you very much Michiel! In fact I have to rework the steering on revision, because the wheels turns opposite direction of steering :-), but to me it doesn`t matter much! Outstanding work on the shaping. I know these cars shape well, as I resurrected my wife抯 grandfathers car that he had bought new after it had been in storage for 30 years. Consistently built MOC. Nice colors too. Henrik my friend, you did it again. 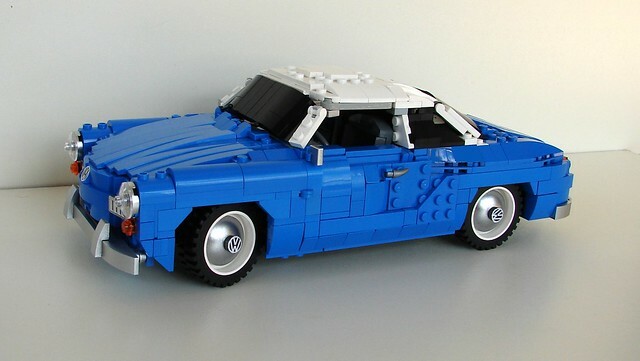 Absolutely fabulous work on this model of the Karmann Ghia. Every detail is spot on. Love it! The shape is great and I just love the little engine. Very good! Hey, there. So, you finally did it! It is different from mine which I like. You have your own style and it works. It is really well done. It looks more sporty than mine which I also like. The thing that I'm not a fan of are the windshield frames. They look too loose but all in all it looks cool, especially the front! I had many important "firsts" in my first car -- a 1970 VW Beetle. But I would rather have had them in a Karmann Ghia -- one of my favorite cars then and now. Wonderful job here, Henrik! The engine is instantly recognizable, and the rear body shaping is spot-on. Glad you decided to forge ahead. Beautiful work and great memories! The design and shaping of the bodywork are phenomenal. Great details and the engine is perfect. Having owned one, briefly, I can attest that the real engine did indeed run on an elastic band and was actually that small! Insane shapping. Colorfull and the details are so precise... Totally nailed it! So pretty - you've done the K-G real justice. Makes you want to get out and drive doesn't it ? Positively gorgeous! The shaping of the car especially the rear passenger doors are magnificent! I Love the engine. As always a real pleasure to see your builds. Thank you! Excellent shape and the steering solution is genius.